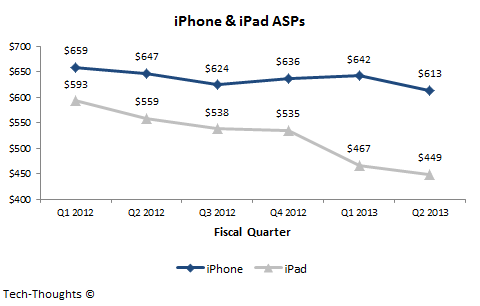 Apple announced results for its fiscal Q2 2013 on Tuesday. The company posted its first QoQ profit decline in years, amid slowing growth. 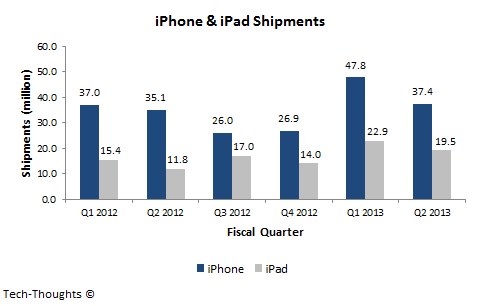 iPhone shipments totaled 37.4 million and iPad shipments totaled 19.5 million for the quarter. Let's look at sales growth and ASP trends to benchmark our previous estimates regarding iPhone growth and iPad Mini cannibalization. iPhone shipments have totaled 85.2 million in H1 fiscal 2013, which is in the same ballpark as my full year estimate of 150 million. This implies a 20% growth over fiscal 2012, but is far cry from previous analyst estimates expecting 200-250 million iPhone sales. Declining QoQ growth trends over successive product cycles are important to understand here, as shipments over the next two quarters could drop to around 60 million ahead of a new iPhone launch. iPhone ASP has reached its lowest level in the past 6 quarters, which implies that older iPhone models are making up an increasing proportion of sales. This is an indication that the market may be unwilling to pay for further product improvements and signals the need for a lower priced iPhone. The same trend was seen in iPad ASPs before the launch of the iPad Mini, but subsidized pricing may have helped the iPhone hold out for longer. This could further hurt margins going forward. Once the iPad Mini was launched, the ASP of the 9.7" iPad would have risen as price sensitive buyers moved on to the cheaper iPad Mini. A higher 9.7" iPad ASP would give us a lower shipment figure with the current figures, so let's assume a base case ASP of $520 (taking into account a previous $535 ASP, inclusive of $25 in accessory revenue per iPad). We can also safely assume that the iPad Mini's ASP stays within 10-20% of its base price ($360-$400). 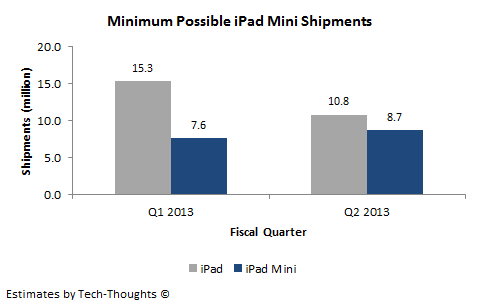 At an ASP of ~$370, we get iPad Mini shipments of 7.6 million in Q1 and 8.7 million in Q2. I consider this to be the lowest possible figure of iPad Mini shipments, as the $520 & $360 ASPs for the 9.7" iPad and iPad Mini are very conservative. However, even this conservative assumption gives us an estimate of 10.8 million for 9.7" iPad shipments. Using an ASP range of $520-$535 for the 9.7" iPad and $360-$400 for the iPad Mini, we get a Q2 shipment range of 8.7-12.0 million for the iPad Mini and 7.5-10.8 million for the 9.7" iPad. As I predicted previously, even the highest possible number would be the lowest quarterly shipment figure for the 9.7" iPad since Q2 2011, i.e. the launch of the original iPad 2. Therefore, given the gains made by competition and cannibalization of 9.7" iPad sales, Apple's launch of the iPad Mini cannot be classified as a successful offensive strategy. However, the iPad Mini can be classified as a good defensive product, as it prevented iPad revenue growth from slipping below estimates.